It was six months ago when Mumbai-based Niyati Shah was watering her plants and she noticed that the plastic pots were invariably damaging her plants. Because of the plastic, air and water weren’t reaching to bottom most layer of the plant. However, it wasn’t the first time she had identified the problem. But it certainly was the first time she decided to come up with a sustainable solution. Thus, began her journey of reducing carbon footprints and preventing plastic bottles from going to the landfill. In order to devote herself completely to her newly found organisation ‘Grow Bags’, Niyati quit her marketing after a two year stint in the beginning of this year. I love gardening. I have several plants outside my house. The way plastic pots are designed, it makes it difficult for the air and water to reach the bottom. After conducting research, I found that virgin plastic (newly manufactured plastic nodules) is used to make the pots. That is when I decided to not only make a product which will provide sufficient air and water to plants but also one in which recycled plastic is used, says 25-year-old Niyati. The first thing Niyati did was to collaborate with different stakeholders, like plastic crushing units and raddiwalas to procure bottles. She co-ordinates with the them and the plastic bottles are put into crushers. After forming plastic film sheets from crushed pieces of plastic, she passes the sheets to another pot maker who mixes fibre with the plastic sheets. The final product is a cloth-like material. Niyati’s solution is better than the plastic pots as the new product is not just made from plastic. As grow bags have materials other than plastic, it absorbs air, water and sunlight in an efficient manner. For each pot or as Niyati fondly calls it ‘grow bag’, three to five PET bottles are reused. And as the size gets bigger, the number of PET bottles recycled and reused also increases. The best part about these plants bags is that it prevents water wastage, “In regular plastic pots, there are holes underneath that lets the water pass quickly. This sometimes leads to the person using more water than required thus damaging the plants. In grow bags, there are no holes, water passes down naturally just like it does when poured on a cloth. Once the bag is filled, one can stop the watering,” she says. The unique material also allows aeration from all sides giving roots the same amount of sunlight and air. The process of air pruning is also facilitated by the grow bags. Air pruning is when a root stops growing and helps new roots to grow. A branched root structure covers more space and takes up more water and nutrient, which in turn leads to a healthier plant and better yields. But it all depends on the container choice, she explains. 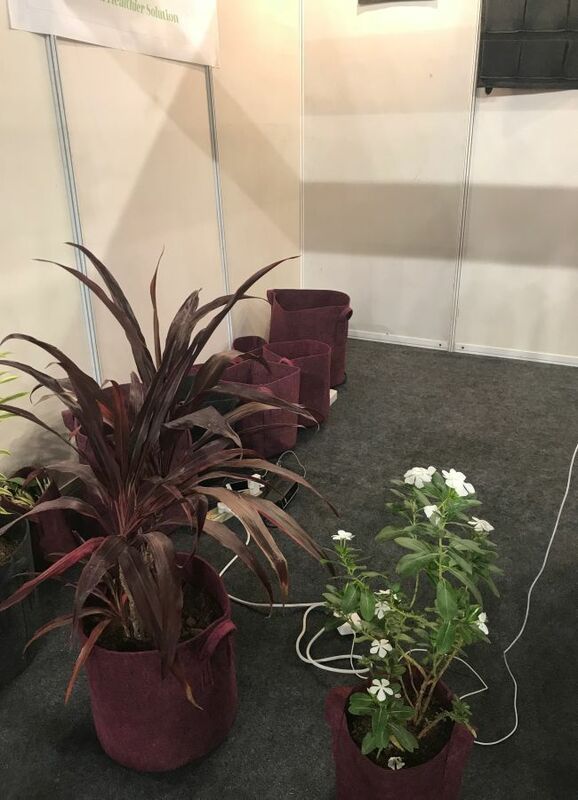 Grow bags are available in different shapes and sizes and Niyati has accommodated the concept of vertical gardening by designing vertical grow bags. It can be used to cultivate fruits, flowers and vegetables and users can also try their hand at organic farming with the help of grow bags. As for the cost, these are priced at the same rate as the regular plastic pots, “Anyone can afford the grow bags as they are not price sensitive,” she says. From corporates, NGOs to residential houses, she has so far supplied more than 100 grow bags, thus recycling thousands of plastic bottles. Impressed by her idea and technology, the Brihanmumbai Municipal Corporation invited her to put up a stall at the three-day plastic alternatives exhibition in Mumbai held recently in preparation of the plastic ban to educate people about viable alternatives to plastic. My aim at the exhibition was not to sell the grow bags but instead educate them about harmful effects of using plastics and also get a feedback from them that would help me improvise my product, says Niyati. Previous Post: Every Contribution Counts: This Woman From Gurugram Starts A ‘Steel Crockery Bank’ To Reduce Plastic Menace. Next Post: This Mumbai College Sets A Positive Example By Saving 840 Kgs Of Waste That Could Have Ended Up In The City’s Dying Landfills.